Nathuram Godse is often a misunderstood character. He is referred to as a Hindu fanatic. 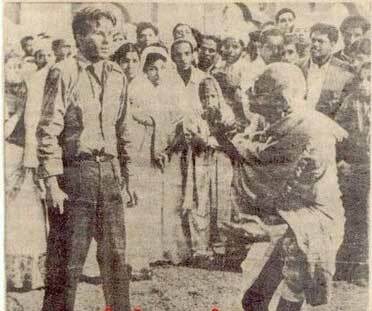 It is often hard to understand Godse because the Government of India had suppressed information about him. His court statements, letters etc. were all banned from the public until recently. Judging from his writings one thing becomes very clear – He was no fanatic. His court statements are very well read out and indicate a calm and collected mental disposition. He never even once speaks ill about Gandhi as a person, but only attacks Gandhi’s policies which caused ruin and untold misery to Hindus. Another interesting point to note is that Godse had been working with the Hindu refugees fleeing from Pakistan. He had seen the horrible atrocities committed on them. Many women had their hands cut off, nose cut off, even little girls had been raped mercilessly. Despite this Godse did not harm even single Muslim in India which he could easily have. So it would be a grave mistake to call him a Hindu fanatic. “Gandhi must be stopped – at any cost” and he justified why Gandhiji’s assassination was not only inevitable but also a delayed action, something that shud’ve happened LONG AGO.